This elegant floor cabinet in antique look with 2 doors and 1 drawer offers ample storage space and will help you to keep your things neatly organized. It will make a great addition to your bedroom, kitchen, bathroom or any other room in the house. The drawers are easily opened, so you can quickly get the things you need. Made from sturdy MDF and pine wood, the cabinet holds up well to everyday wear and tear. The white paint finish makes it easy to clean with a damp cloth. This versatile cabinet in antique look will give you some extra storage space in your bedroom, kitchen, bathroom, or any other room in the house. Made from sturdy MDF and pine wood, the cabinet holds up well to everyday wear and tear. 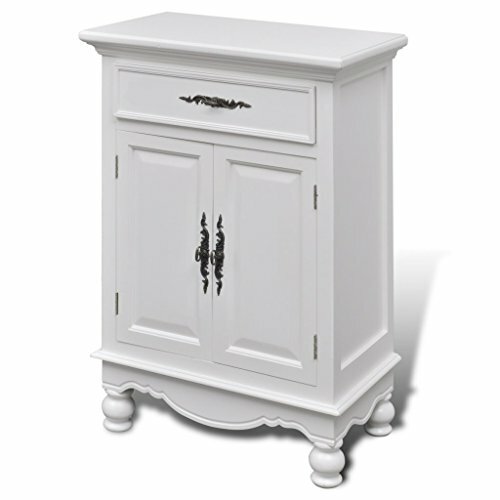 This elegant floor cabinet in antique look with 2 doors and 1 drawer. The white paint finish makes it easy to clean with a damp cloth.